You are here: Home / Learn / What is Tea Flush? Tea flush is all about tea leaves and the perfect time to pick them. Tea flush started in Darjeeling, India in the mid-19th century. Darjeeling sits at 6700 ft. in the Lesser Himalaya mountain range. Just like growing beautiful flowers or tasty vegetables, everything depends on the weather, namely sun and rain, and additionally, the soil (or terroir) where the plants are grown. Weather patterns in Darjeeling generate different growth times for tealeaves. To differentiate the growth times, the tea planters used “flush” to show the differences. 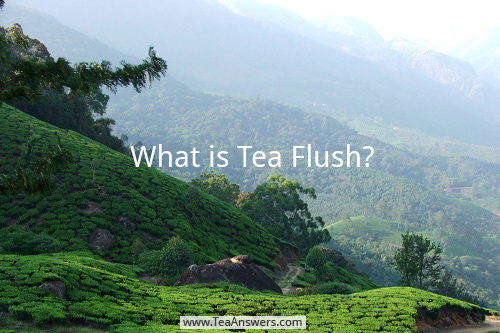 How many tea flushes per plant? Tea plants have three flushes: first, second, and third. Sometimes, the flushes are called first, monsoon, and autumn. Each flush time has its own time during the year. A flush may come earlier or later depending on the weather. First flush tea arrives during early to late spring in March to May. This time is when the tea plants have rested over the winter and days begin to get longer and warmer. Sunlight and warmth makes for happy tea plants, which send out new leaves to soak up that sunshiny goodness. Tea made from the first flush has a taste like sunshine – light, bright, and fresh. First flush tea costs more. There is one short spring per year and only so much new growth on each tea plant. Less growth creates less supply. Tea connoisseurs love first flush teas and are willing to pay a premium to get them. Second flush tea arrives during early to late summer. This next stage in tea flush is marked by vigorous root, stem, and leaf growth on the tea plants. Monsoon rains during the second flush bring much needed nourishment to the tea plants. Second flush teas are darker in color and the taste brings out more terroir. Second flush teas cost less because the tea leaves are more abundant and are picked for a longer time. Some tea connoisseurs pass over the second flush teas as they believe the tea flavor is not robust because the tea plant has taken up too much water from the rains. Third flush tea arrives during early to late autumn. The rains stop and growth slows down for third flush teas. Terroir is strongest during this stage. Tea connoisseurs like third flush teas as tea made from third flush pickings tastes earthy and robust. Third flush teas are a dark amber color when brewed. Look at the tealeaves for color. The lighter the color the potential for the earlier flush stage. Brew your tea and pour it into a light colored or clear glass cup. Look at the color of the tea in the tea cup. Is it light, medium, or dark colored? Taste your tea. Does it have a light taste, a little earthiness or a strong earthy taste? I keep a notebook of the teas I drink. I write down what the tea looked like and how it tasted. This makes it easy for me to spot which teas are from first, second, or third flush tea leaves.